In the past, Christmas has proven to be a very busy time of year for Make Believe Events and since our beginnings as a party company we have introduced services to offer customers a whole variety of festive fun! We cater for corporate children’s parties and are happy to take on bookings for small gatherings right through to large scale events. Please get in touch about any festive events you may have planned - we are sure to be able to offer you a unique Christmas experience! Make Believe Parties can help make your Family fun day a great success - whether we entertain the children present as a whole group or organise various activities which the children can work their way around in their own time - such as arts and crafts stalls, cake decorating tables, face painting and bouncy castle. Please let us know your event date and budget and we will organise as many fun activities as possible for your special fun day! Our staff will ensure you get the message across. From product promotion to store openings, our fun and enthusiastic staff will engage your potential customers and build desire for your product or event! 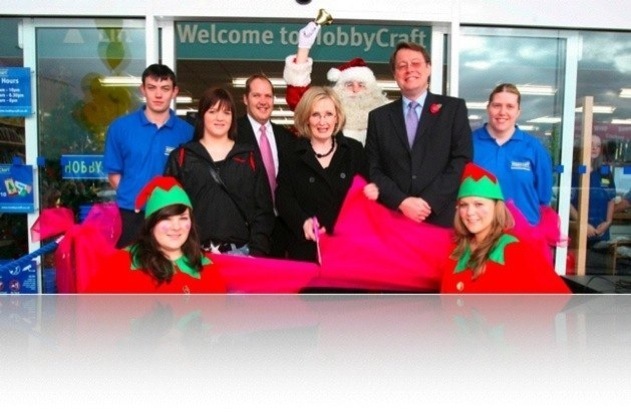 One of our recent successful events was the HobbyCraft store opening at Glasgow Fort, shown above. Similarly, if you require a particular theme in-keeping with your event or product then we are happy to meet these needs as best we can. Our vast event and marketing experience means that Make Believe Events can offer you unique promotions to suit your brand and budget.